Lack of a zoom, not to mention bowel-shrinking fear, prevented me from getting a better shot of the Diamondback rattlesnake. My golf ball is in that bush somewhere. If you’re a Canucks fan, think Game 7 versus Boston, with a reasonable chance of death thrown in. 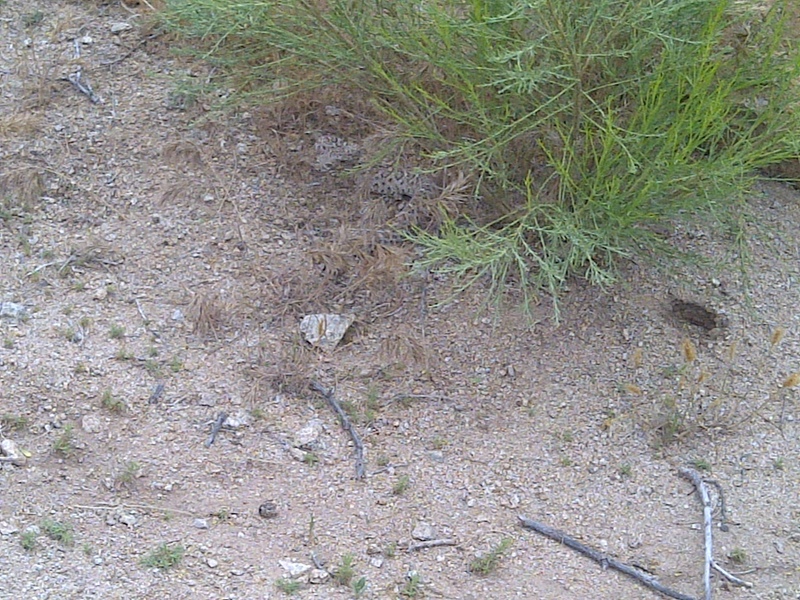 So when I trod on a Diamondback rattlesnake last week, I didn’t really have time to think about any of that. I was looking for a golf ball; my third lost golf ball in as many holes at a Tucson, Arizona course. The first I heard was a hiss, or maybe more of a ‘shush’. I’m not sure the experts recommend that response, but then looking a cougar in the eye never struck me as realistic. Or are you supposed to look away. Can’t remember. Shock gave way to curiosity, and with my bowels under control, I edged a little closer to the dusty, brown coil of fury. And like any dumb tourist would, I slowly reached for my cell phone and snapped the lame, off-focus photo you see above. “You know, they can move pretty fast,” said one of my playing partners, from about 100 feet away. I don’t like golf much. Unfortunately it shows. But I will say this: You’d be surprised how straight you hit a ball after stepping on a snake.